Is there a better alternative to Sheets? Is Sheets really the best app in Language category? Will Sheets work good on macOS 10.13.4? 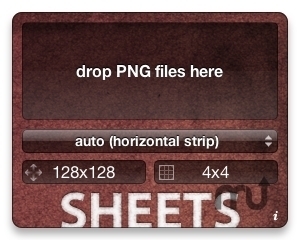 Sheets is an OS X widget that automates the process of building sprite sheets from image sequences. Using ImageMagick, animations can be output in strips, sheets, or with custom settings for scale and tiling. File sheets (also known as contact sheets) can also be generated, with file name and original size clearly labeled under each thumbnail. Large collections are automatically paginated when necessary. Sheets needs a review. Be the first to review this app and get the discussion started! Sheets needs a rating. Be the first to rate this app and get the discussion started! Images can be a collection (select multiple files in Finder, then click-drag while opening up Dashboard, and releasing within the drop area), or a single image from a numerical series (Sheets will automatically gather the rest of the images for the sequence). While groups of files can contain any number of files and various file names, images are sorted lexicographically - full serial numbers are required for best results (0000 through 0100 will sort correctly, while 0 through 100 will not). When scaling images to fit within specific dimensions, the scaling algorithm can be selected in the preferences side of the widget. Also new are the alpha output options - transparent (premultiplied), flattened (removed), extracted (alpha only), and multiple files, which produces transparent, RGB, and A files for use in other tools that require straight RGB input (for example, ImageMagick doesn't support straight RGB in the TIF format, so multiple files are the only way to retain all RGB data). This widget requires ImageMagick to run, please see imagemagick.org for details. In my experience installing via MacPort (macports.org) can take a lot of processing time, but it requires far less user input - just set it up, and let it run for a bit while it installs everything automatically.